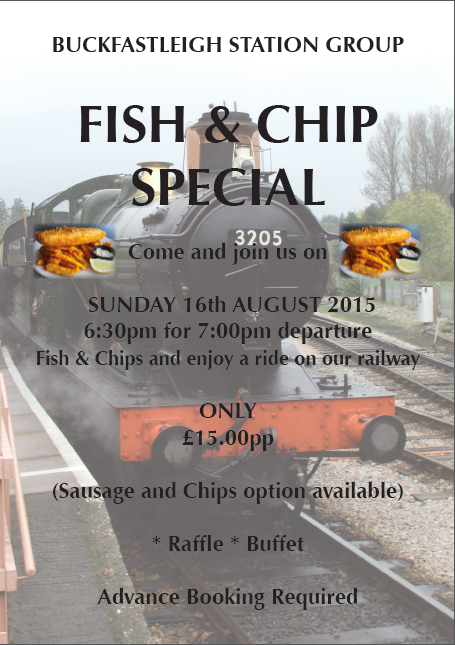 On Sunday the 16th August 2015 the Buckfastleigh Station Group has organised a Fish and Chip Train – 6.30 for 7.00 p.m. departure. Tickets cost £15 per person include train travel and fish or sausage and chips must be purchased in advance by calling telephone number 01364 644370. Pre–paid tickets can be posted or collected on the night.